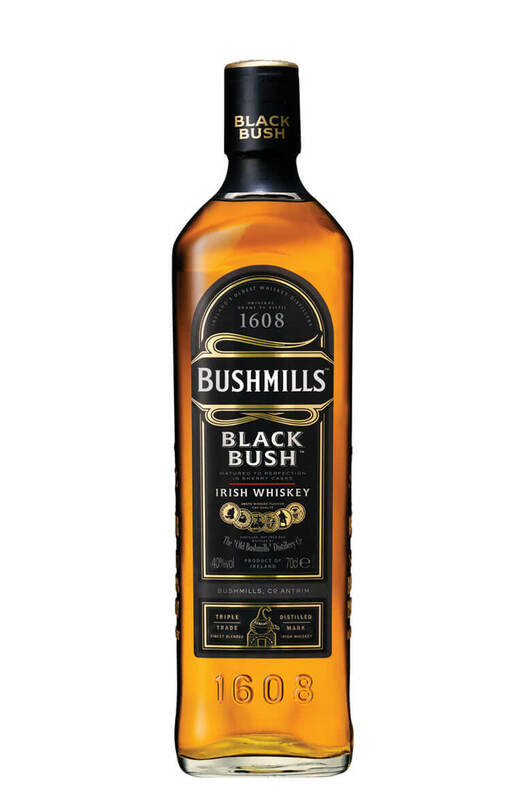 Black Bush is classed as the 'deluxe' blend from Bushmills and it has a lot of loyal fans across the world. Compared to the standard blend this has more depth, richness but also some woody hints. Maybe not as smooth as the Bushmills Original but it packs a lot more flavour. This is vatted from approximately 80% malt whiskey and 20% grain whiskey some of which is aged for as long as 18 years. A very high proportion of ex-sherry casks are used for the maturation giving the whiskey its signature dark colour and some delicious flavours of dried fruits, roasted nuts and caramel toffees. This still ranks as one of the best blended whiskeys in the world! Nose A distinctive, full bodied aroma with spicy, malty and nutty sweet sherry notes. Palate Big and full to start off with‚ quickly becoming light with a hint of spicy fruit. Floats across your tongue to the back of your throat where it rests as a slight sherry sweetness. Finishes with a lingering‚ smooth sweetness that flourishes into your cheeks. Types of Barrel used for Aging It is mainly matured in oloroso sherry casks. Composition Deluxe blend of triple distilled whiskeys containing 80% malt whiskey some of which is aged for up to 18 years. Any Additional Information of Note One of the best blended whiskeys in the world! Awards and/or Press Quotes Silver Medal - San Francisco World Spirits Competition 2009. Silver Medal - International Wine & Spirits Competition 2009. Scarlet Lady The cocktail a Scarlet Lady is a great recommendation for someone who is looking for bubbles!